Esselte Corporation 57509EE - 2 pocket Folders. Letter Size. These two-pocket folders are durable enough to reuse as needed. Yellow. Holds 100 Sheets. 25 per Box. Biv would approve. Nice, subtle texture: Textured paper hides marks and smudges. Presentation ready: whether you're creating conference handouts or volunteer packets, these twin-pocket folders hold up to 50 sheets in each pocket with space for a business card. Color code to your heart’s content or stick to your favorite shade. Oodles of uses: perfect for schoolwork, home organization or professional projects; each pocket holds up to 50 sheets of paper. Helpful at home: keep a box of pocket folders on hand at home to store receipts, gather yearly tax paperwork or organize bids for renovation projects. 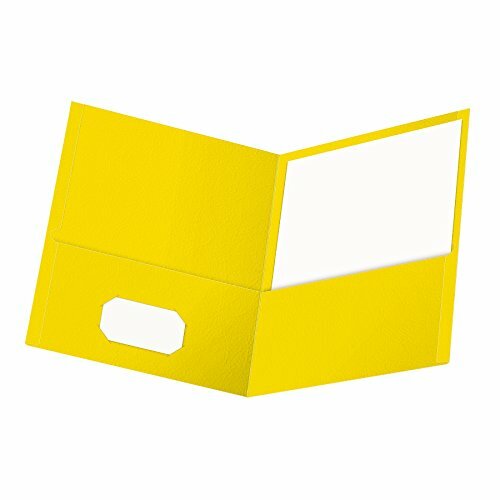 Oxford Twin-Pocket Folders, Textured Paper, Letter Size, Yellow, Holds 100 Sheets, Box of 25 57509EE - What you get: box of 25 yellow, two-pocket folders made from durable, letter-sized, textured paper with interior die-cut business card holder. Value priced: these economy folders are a smart buy; stock up for the year, an event or just general organization. Oxford twin-pocket folders keep things in order in the classroom, at home and at the office. School approved: great for teachers and students; organize by subject, topic, class or project in enough color options to satisfy any back-to-school list. With over 15 colors to choose from, you’re sure to find the right folder for your needs. A rainbow of color Options: ROY G.
Esselte Corporation 57511EE - Helpful at home: keep a box of pocket folders on hand at home to store receipts, gather yearly tax paperwork or organize bids for renovation projects. Oxford twin-pocket folders keep things in order in the classroom, at home and at the office. A rainbow of color Options: ROY G. 25 per Box. School approved: great for teachers and students; organize by subject, topic, class or project in enough color options to satisfy any back-to-school list. What you get: box of 25 red, letter-sized, two-pocket folders made from durable, textured paper with interior die-cut business card holder. Value priced: these economy folders are a smart buy; stock up for the year, an event or just general organization. With over 15 colors to choose from, you’re sure to find the right folder for your needs. Oxford Twin-Pocket Folders, Textured Paper, Letter Size, Red, Holds 100 Sheets, Box of 25 57511EE - Letter Size. Color code to your heart’s content or stick to your favorite shade. 2 pocket Folders. These two-pocket folders are durable enough to reuse as needed. Oodles of uses: perfect for schoolwork, home organization or professional projects; each pocket holds up to 50 sheets of paper. Holds 100 Sheets. Nice, subtle texture: Textured paper hides marks and smudges. Esselte Corporation 57501EE - Biv would approve. School approved: great for teachers and students; organize by subject, topic, class or project in enough color options to satisfy any back-to-school list. These two-pocket folders are durable enough to reuse as needed. What you get: box of 25 red, letter-sized, two-pocket folders made from durable, textured paper with interior die-cut business card holder. Value priced: these economy folders are a smart buy; stock up for the year, an event or just general organization. 25 per Box. Presentation ready: whether you're creating conference handouts or volunteer packets, these twin-pocket folders hold up to 50 sheets in each pocket with space for a business card. Oxford Twin-Pocket Folders, Textured Paper, Letter Size, Light Blue, Holds 100 Sheets, Box of 25 57501EE - Presentation ready: whether you're creating conference handouts or volunteer packets, these twin-pocket folders hold up to 50 sheets in each pocket with space for a business card. Color code to your heart’s content or stick to your favorite shade. Helpful at home: keep a box of pocket folders on hand at home to store receipts, gather yearly tax paperwork or organize bids for renovation projects. Helpful at home: keep a box of pocket folders on hand at home to store receipts, gather yearly tax paperwork or organize bids for renovation projects. 2 pocket Folders. Holds 100 Sheets. Esselte Corporation 57510EE - Nice, subtle texture: Textured paper hides marks and smudges. Presentation ready: whether you're creating conference handouts or volunteer packets, these twin-pocket folders hold up to 50 sheets in each pocket with space for a business card. Oxford twin-pocket folders keep things in order in the classroom, at home and at the office. Oodles of uses: perfect for schoolwork, home organization or professional projects; each pocket holds up to 50 sheets of paper. These two-pocket folders are durable enough to reuse as needed. Color code to your heart’s content or stick to your favorite shade. Holds 100 Sheets. School approved: great for teachers and students; organize by subject, topic, class or project in enough color options to satisfy any back-to-school list. Oxford Twin-Pocket Folders, Textured Paper, Letter Size, Orange, Holds 100 Sheets, Box of 25 57510EE - 25 per Box. Orange. Helpful at home: keep a box of pocket folders on hand at home to store receipts, gather yearly tax paperwork or organize bids for renovation projects. 2 pocket Folders. With over 15 colors to choose from, you’re sure to find the right folder for your needs. What you get: box of 25 light blue, letter-sized, two-pocket folders made from durable, textured paper with interior die-cut business card holder. Esselte Corporation 57514 - Presentation ready: whether you're creating conference handouts or volunteer packets, these twin-pocket folders hold up to 50 sheets in each pocket with space for a business card. Oodles of uses: perfect for schoolwork, home organization or professional projects; each pocket holds up to 50 sheets of paper. Nice, subtle texture: Textured paper hides marks and smudges. 2 pocket Folders. With over 15 colors to choose from, you’re sure to find the right folder for your needs. Purple. Letter Size. Presentation ready: whether you're creating conference handouts or volunteer packets, these twin-pocket folders hold up to 50 sheets in each pocket with space for a business card.
. School approved: great for teachers and students; organize by subject, topic, class or project in enough color options to satisfy any back-to-school list. Helpful at home: keep a box of pocket folders on hand at home to store receipts, gather yearly tax paperwork or organize bids for renovation projects. Oxford Twin-Pocket Folders, Textured Paper, Letter Size, Purple, Holds 100 Sheets, Box of 25 57514EE - Presentation ready: whether you're creating conference handouts or volunteer packets, these twin-pocket folders hold up to 50 sheets in each pocket with space for a business card. What you get: box of 25 light blue, letter-sized, two-pocket folders made from durable, textured paper with interior die-cut business card holder. Value priced: these economy folders are a smart buy; stock up for the year, an event or just general organization. Esselte Corporation 57502EE - A rainbow of color Options: ROY G. Blue. School approved: great for teachers and students; organize by subject, topic, class or project in enough color options to satisfy any back-to-school list. Nice, subtle texture: Textured paper hides marks and smudges. What you get: box of 25 orange, two-pocket folders made from durable, letter-sized, textured paper with interior die-cut business card holder. Value priced: these economy folders are a smart buy; stock up for the year, an event or just general organization. Presentation ready: whether you're creating conference handouts or volunteer packets, these twin-pocket folders hold up to 50 sheets in each pocket with space for a business card. School approved: great for teachers and students; organize by subject, topic, class or project in enough color options to satisfy any back-to-school list. Oxford Twin-Pocket Folders, Textured Paper, Letter Size, Blue, Holds 100 Sheets, Box of 25 57502EE - Presentation ready: whether you're creating conference handouts or volunteer packets, these twin-pocket folders hold up to 50 sheets in each pocket with space for a business card. What you get: box of 25 light blue, letter-sized, two-pocket folders made from durable, textured paper with interior die-cut business card holder. Value priced: these economy folders are a smart buy; stock up for the year, an event or just general organization. Presentation ready: whether you're creating conference handouts or volunteer packets, these twin-pocket folders hold up to 50 sheets in each pocket with space for a business card. With over 15 colors to choose from, you’re sure to find the right folder for your needs. Esselte Corporation 57505EE - What you get: box of 25 orange, letter-sized, two-pocket folders made from durable, textured paper with interior die-cut business card holder. Value priced: these economy folders are a smart buy; stock up for the year, an event or just general organization. What you get: box of 25 red, two-pocket folders made from durable, letter-sized, textured paper with interior die-cut business card holder. Value priced: these economy folders are a smart buy; stock up for the year, an event or just general organization. School approved: great for teachers and students; organize by subject, topic, class or project in enough color options to satisfy any back-to-school list. School approved: great for teachers and students; organize by subject, topic, class or project in enough color options to satisfy any back-to-school list. Oxford Twin-Pocket Folders, Textured Paper, Letter Size, Gray, Holds 100 Sheets, Box of 25 57505EE - A rainbow of color Options: ROY G. School approved: great for teachers and students; organize by subject, topic, class or project in enough color options to satisfy any back-to-school list. What you get: box of 25 gray, two-pocket folders made from durable, letter-sized, textured paper with interior die-cut business card holder. Value priced: these economy folders are a smart buy; stock up for the year, an event or just general organization. What you get: box of 25 blue, letter-sized, two-pocket folders made from durable, textured paper with interior die-cut business card holder. Value priced: these economy folders are a smart buy; stock up for the year, an event or just general organization. Avery AVE47987 - Helpful at home: keep a box of pocket folders on hand at home to store receipts, gather yearly tax paperwork or organize bids for renovation projects. Presentation ready: whether you're creating conference handouts or volunteer packets, these twin-pocket folders hold up to 50 sheets in each pocket with space for a business card. School approved: great for teachers and students; organize by subject, topic, class or project in enough color options to satisfy any back-to-school list. Two-pocket textured-paper folders provide room for papers, brochures and booklets, making them ideal for presentation and general-office use. Rich coloring helps you locate them easily and makes for an eye-catching presentation. Avery 47987 Two-Pocket Folder, 40-Sheet Capacity, Green Box of 25 - Includes business card slots on the inside front pocket. Holds up to 20 sheets of paper. Presentation ready: whether you're creating conference handouts or volunteer packets, these twin-pocket folders hold up to 50 sheets in each pocket with space for a business card. Helpful at home: keep a box of pocket folders on hand at home to store receipts, gather yearly tax paperwork or organize bids for renovation projects. School approved: great for teachers and students; organize by subject, topic, class or project in enough color options to satisfy any back-to-school list. What you get: box of 25 orange, letter-sized, two-pocket folders made from durable, textured paper with interior die-cut business card holder. Value priced: these economy folders are a smart buy; stock up for the year, an event or just general organization. Esselte Corporation 57512 - 25 per Box. Helpful at home: keep a box of pocket folders on hand at home to store receipts, gather yearly tax paperwork or organize bids for renovation projects. Helpful at home: keep a box of pocket folders on hand at home to store receipts, gather yearly tax paperwork or organize bids for renovation projects. School approved: great for teachers and students; organize by subject, topic, class or project in enough color options to satisfy any back-to-school list. School approved: great for teachers and students; organize by subject, topic, class or project in enough color options to satisfy any back-to-school list. Oxford Twin-Pocket Folders, Textured Paper, Letter Size, Royal Blue, Holds 100 Sheets, Box of 25 57512EE - Helpful at home: keep a box of pocket folders on hand at home to store receipts, gather yearly tax paperwork or organize bids for renovation projects. What you get: box of 25 purple, two-pocket folders made from durable, letter-sized, textured paper with interior die-cut business card holder. Value priced: these economy folders are a smart buy; stock up for the year, an event or just general organization. School approved: great for teachers and students; organize by subject, topic, class or project in enough color options to satisfy any back-to-school list. Helpful at home: keep a box of pocket folders on hand at home to store receipts, gather yearly tax paperwork or organize bids for renovation projects. Color code to your heart’s content or stick to your favorite shade. Royal Blue. Presentation ready: whether you're creating conference handouts or volunteer packets, these twin-pocket folders hold up to 50 sheets in each pocket with space for a business card. Esselte Corporation 57568 - What you get: box of 25 blue, letter-sized, two-pocket folders made from durable, textured paper with interior die-cut business card holder. Value priced: these economy folders are a smart buy; stock up for the year, an event or just general organization. Helpful at home: keep a box of pocket folders on hand at home to store receipts, gather yearly tax paperwork or organize bids for renovation projects. Color code to your heart’s content or stick to your favorite shade. What you get: box of 25 red, letter-sized, two-pocket folders made from durable, textured paper with interior die-cut business card holder. Value priced: these economy folders are a smart buy; stock up for the year, an event or just general organization. Nice, subtle texture: Textured paper hides marks and smudges. These two-pocket folders are durable enough to reuse as needed. Helpful at home: keep a box of pocket folders on hand at home to store receipts, gather yearly tax paperwork or organize bids for renovation projects. Presentation ready: whether you're creating conference handouts or volunteer packets, these twin-pocket folders hold up to 50 sheets in each pocket with space for a business card. Oxford Twin-Pocket Folders, Textured Paper, Letter Size, Pink, Holds 100 Sheets, Box of 25 57568EE - School approved: great for teachers and students; organize by subject, topic, class or project in enough color options to satisfy any back-to-school list. School approved: great for teachers and students; organize by subject, topic, class or project in enough color options to satisfy any back-to-school list. With over 15 colors to choose from, you’re sure to find the right folder for your needs. Esselte Corporation 57556EE - Letter Size. School approved: great for teachers and students; organize by subject, topic, class or project in enough color options to satisfy any back-to-school list. Presentation ready: whether you're creating conference handouts or volunteer packets, these twin-pocket folders hold up to 50 sheets in each pocket with space for a business card. Hunter Green. What you get: box of 25 red, letter-sized, two-pocket folders made from durable, textured paper with interior die-cut business card holder. Value priced: these economy folders are a smart buy; stock up for the year, an event or just general organization. School approved: great for teachers and students; organize by subject, topic, class or project in enough color options to satisfy any back-to-school list. What you get: box of 25 light blue, letter-sized, two-pocket folders made from durable, textured paper with interior die-cut business card holder. Value priced: these economy folders are a smart buy; stock up for the year, an event or just general organization. School approved: great for teachers and students; organize by subject, topic, class or project in enough color options to satisfy any back-to-school list. Oxford Twin-Pocket Folders, Textured Paper, Letter Size, Hunter Green, Holds 100 Sheets, Box of 25 57556EE - School approved: great for teachers and students; organize by subject, topic, class or project in enough color options to satisfy any back-to-school list. Helpful at home: keep a box of pocket folders on hand at home to store receipts, gather yearly tax paperwork or organize bids for renovation projects.